I told this story on my blog last July. And I included that second photo in my "Best of 2015" layout. Now I have the story fully scrapbooked and saved for posterity! 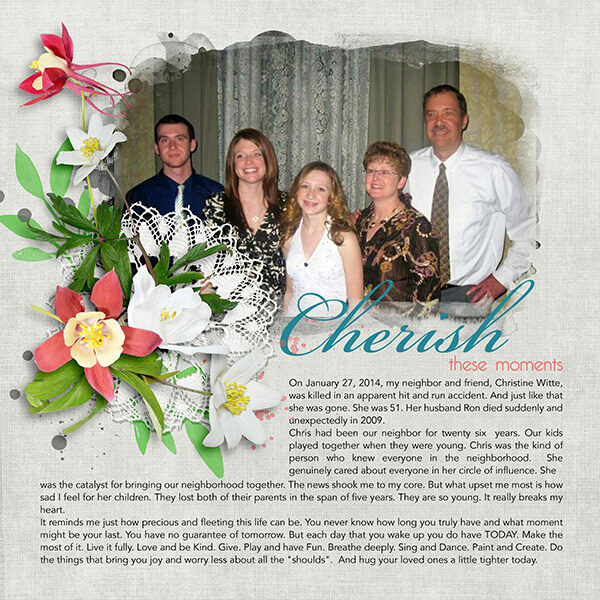 I started this layout with a Studio Rosey Posey blended template that I had to modify drastically because I had more journaling than would fit! 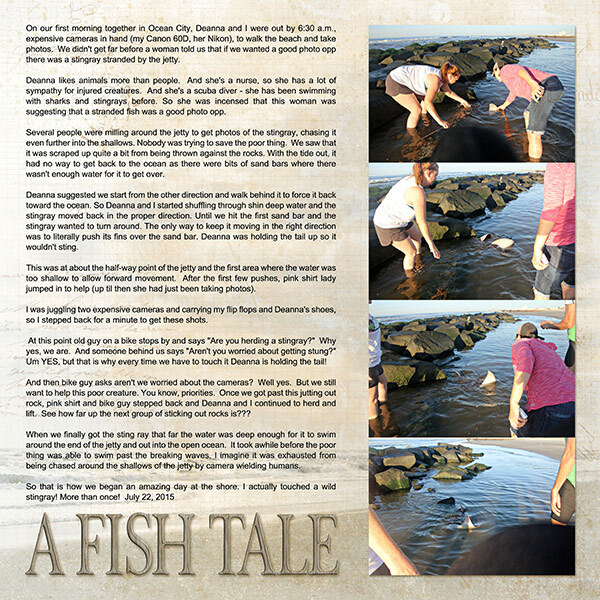 Another blog story turned layout. 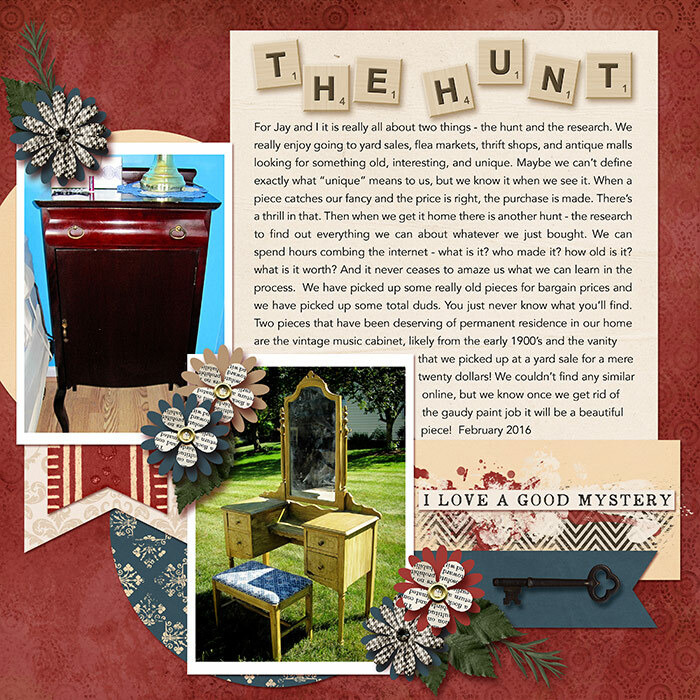 Made with a Connie Prince template and Krystal Hartley's newest kit called "Get A Clue". I'm glad to be including our shared hobby turned business in our "Things We Do" Library of Memories album. Here's another story that was included in my Five Faves list last March - finally told! Connie Prince template and "Life is Good" kit by Kimeric. And here is the only digital layout that I created during the crop in January - which completes my Five Faves list from last March! Although it took me nearly a year, at least these stories have all been told! Hello Cher1, hoping to catch up a bit today. Thank you so much for visiting me all these months, I really, really appreciate you. LOAD sounds like total stress to me! I do so admire you. The family that your 1st page is about crossed my mind a week or two ago. I remember so well reading about it on your blog. I wondered how the children were, how on earth did they get over their tragedy and were they able to move on. Your LO's are amazing. You have some marvelous stories told here. It's not the kind of thing that gets told in my Project Life pages, but these longer stories COULD find a home there. You've given me some food for thought. That vanity you found reminds me of the dresser in my bedroom growing up. These are all great! Such wonderful stories that you've got preserved on layouts now. Isn't it great to be able to pull the blog posts and have ready made journaling? What a lovely layout but truly sad story of your friend & neighbour Chris. Did they ever catch the hit & run driver? I love your layouts, but I especially love your stories. That's what it's all about to me!!! I really love your mystery story. I've never tried to find furniture information on the internet, but it sounds like trying to find a needle in a haystack. I have run down info on my old camera collection. It is really fun to find that something is worth more than you paid for it.